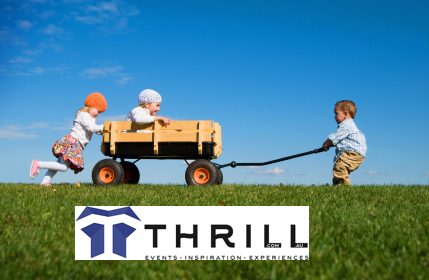 Thrill creates exceptional fun Billy Cart Grand Prix Race Charity Team Building Activities that are exciting fun for small business and large Corporate Group Events throughout Sydney, Melbourne, Brisbane and on the Gold Coast around Surfers Paradise. Billy Karts built can race tested by your staff with excellent competitions and championship winners for corporate groups and businesses of 15-100’s of staff and employees in all locations. After all the action. Your teams specially decorated race carts are gifted or donated to a most deserving local kids charity. This is ‘Sheer team building brilliance’! With laughter and smiles all round as 100% staff engagement results! Employees and teams will be using their teamwork, problem solving, collaboration and communication skills. Working out how to build safe functioning billy karts. Under supervision of the Thrill MC host motivators, race mechanics and facilitators. After the Billy Kart building and safety inspections by the head mechanic are accomplished. The fun, whacky and serious races begin. Teams line up their decorated machines and propel their karts, to kick off the championship races. Laughter, enjoyment, great times reliving the youthful exuberance of a shared play where winning is the twinkle in our eyes. But the wisdom takes over as children arrive who will receive the billy carts as ethical gifts. Wonderfully enjoyable team building event that will get your team members working as a high-performing, collaborative unit. 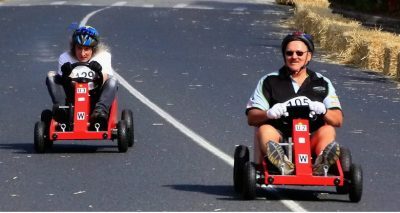 Similar to the Human Powered Vehicle Challenge by RACV. Thrill events Billy Cart Derby challenges your people to design and build the best billy cart with the resources and tools provided in all locations. Indoors or outdoors along tracks and trails, sports fields and hotel resorts. Thrill travels along the East Coast of Australia from Melbourne, Great Ocean Road, Canberra, ACT, South Coast, Southern Highlands, Hunter Valley, Blue Mountains and Central Coast. All Conference Venues, Resorts and Hotels. With incredible corporate events on the Central and Gold Coast all the way through Brisbane and Sunshine Coasts Function Centers. Participate in friendly games to collect the necessary Billy Cart parts. Then construct and decorate, paint, sticker and bling to make it more Top Gear awesome!!! Thrill supplies team development workshops with strong reinforced Billy Cart Flat Pack Operations suited to handle the weight, neglect and ‘abuse of children’. Through healthy activities where corporate business can make a positive impact. Here is quick link to the red bull billy cart races – just for charity building, hilarity and fun! Lets talk and find out what we can create for your team bonding, off-sites, corporate events and staff planning days that make a positive impact!